The curator of the British Museum gives the important and interesting advice that J-J Guiffrey (1866) in “LÓeuvre de Ch. Jacque: Catalogue de ses eaux-fortes et pointes seches” does not describe this print “despite having been made in 1845/47 as part of a series of pastiches which he records” (ibid). Condition: rich and well-printed impression but with beginning signs of wear to the plate, on fine wove (Japan) paper, trimmed with narrow margins and lined on a conservator’s support sheet. Near pristine condition (i.e. there are no stains, tears, holes, abrasions, folds or foxing). I am selling this original etching by Jacque after José de Ribera for AU$118 (currently US$87.95/EUR82.60/GBP69.15 at the time of this listing) including postage and handling to anywhere in the world. If you are interested in purchasing this arresting image, please contact me (oz_jim@printsandprinciples.com) and I will send you a PayPal invoice to make the payment easy. 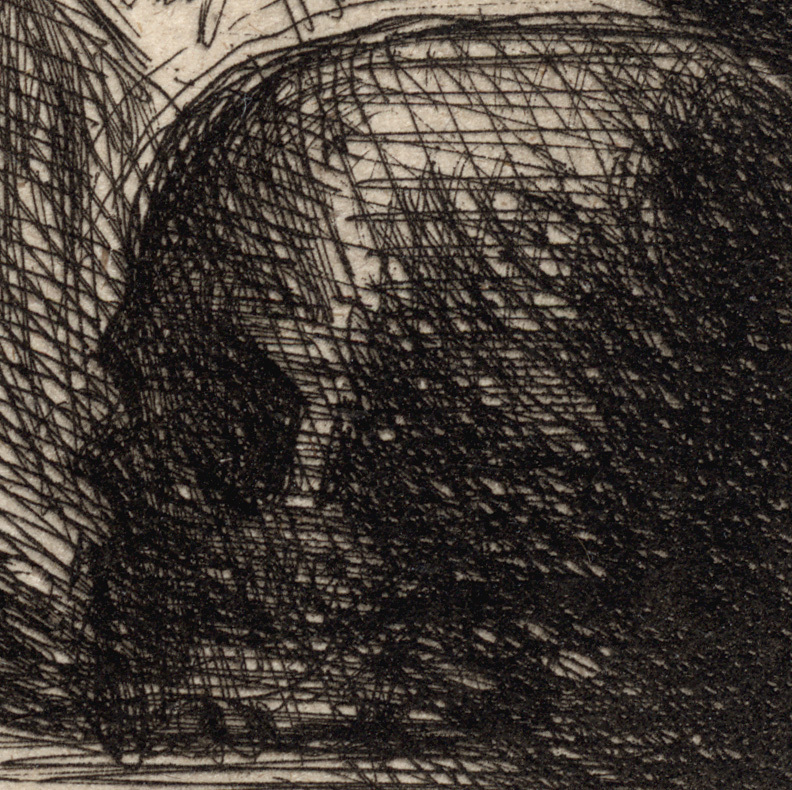 There is a skull portrayed in the murky shadows at the lower right corner of this print. 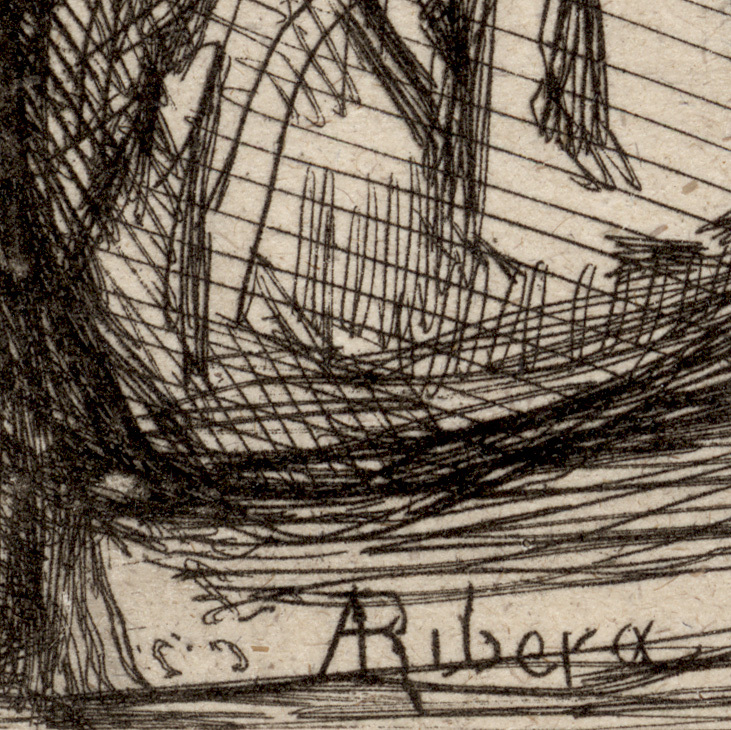 Such a subject to be included in an image referencing the time of José de Ribera—the 17th century—was not by chance nor was it considered an incidental feature. The whole meaning of images with skulls in them was grounded on the significance of what skulls symbolise: death (and an array of other associated meanings). 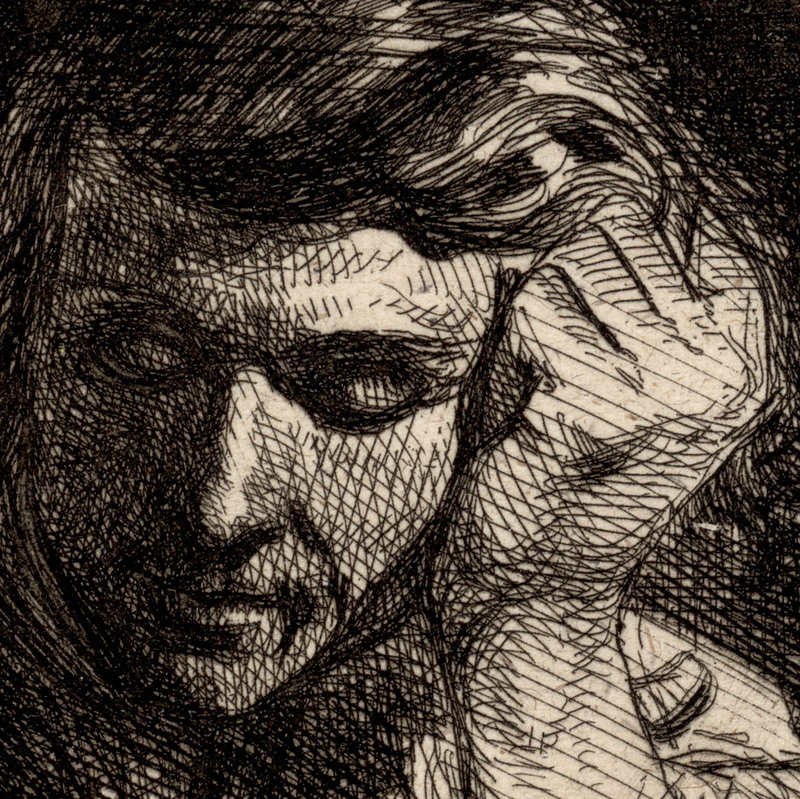 By the time that Jacque was making images, the symbolism of skulls was so ingrained that even a slight indication of one was enough for learned folk to understand what the image was all about. In truth, however, the symbolism was not specifically death but rather a codified warning that “things” die. 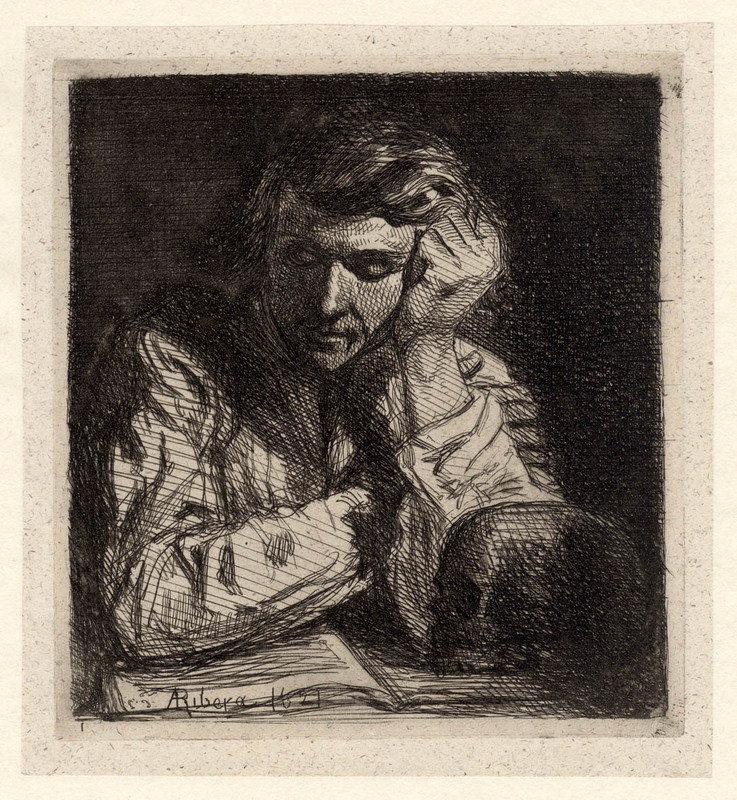 This is the notion of vanitas which is Latin for “emptiness.” Although I may be wrong, the meaningful point of this print of a man reading beside a skull is that his earthly pursuit of knowledge is ultimately worthless. He will die and he will die with the knowledge that he has procured. What I like about this image is the arrangement of the skull on the desk. Jacque, in the manner of Ribera, has cast the skull in shadow. 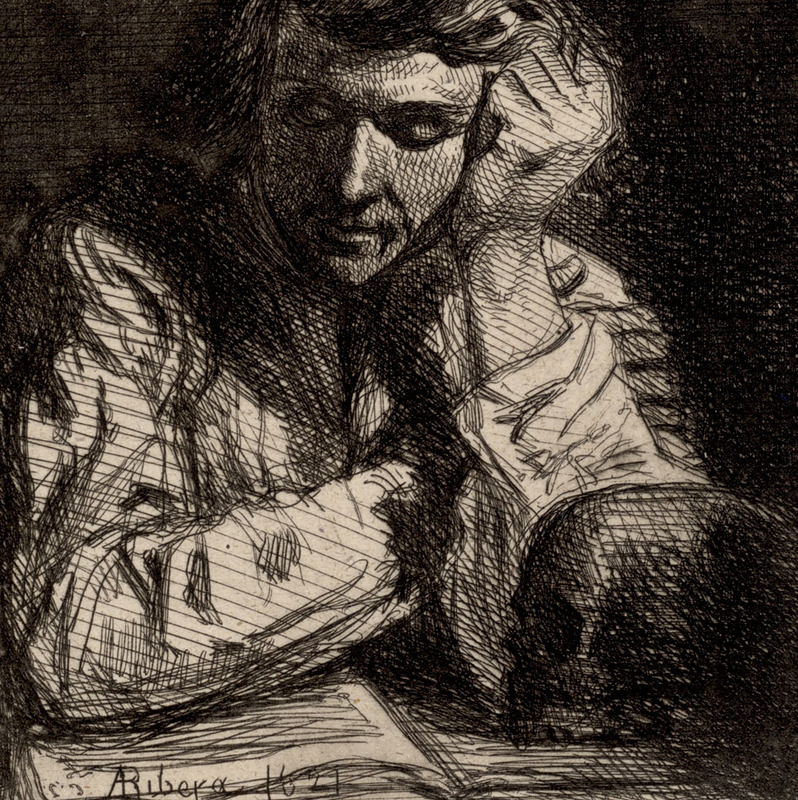 Moreover, the skull seems to be reading what the man is reading from the shadows. For me, this treatment of a skull is fascinating as it presents death lurking in the shadows while the temporal world of an everyday pleasure—reading—is clearly seen in the light. Arguably, there is a play of dualities here between the meaning of light and the meaning of shadow.